American companies are using email marketing techniques much more effectively than companies in Europe. According to a Mailjet study of brands in American and Europe, there were several areas in which firms based in the USA were ahead of their European counterparts. The study found, for instance, that nine out of ten businesses in the USA were linking email marketing with social media activity, yet this was being done by only a little more than three quarters of European companies. Similarly, in America 93% of companies use split testing of emails, but in Europe that falls to 80%. America was generally ahead of Europe except in a couple of key areas. In particular, in Germany the inclusion of past customer information in emails to personalise them more was much more prevalent. Overall, though, it appears that American companies have the edge on those in Europe, adopting email marketing techniques and methods more frequently. 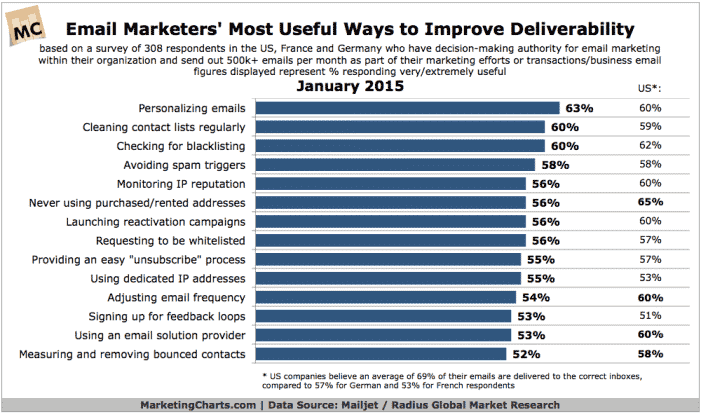 These issues, though, are important because they affect email deliverability. The study also found that the email marketers believed that the most important factor in ensuring their emails were delivered was personalisation. Nothing new in that. But second on the list was having a clean email list. That begs the question how often do you clean out your mailing lists? Ideally that should be a regular task – the more people on your mailing list the more frequently you need to do this. Interestingly, some of the most frequently asked questions about email marketing – such as how often should you send out email marketing messages and which email company should you use were amongst the least important factors in ensuring deliverability of emails. The study implies that the most important things to concentrate on are having a clean list of people who you contact in deep, personal ways. That is by far the best way of getting emails opened – and it is the kind of thing concentrated on by the leading email marketers in this study.